Kayla the koala bear by Charlie Bears has been created from soft plush grey fur and joins us as part of the Happily Ever After collection, new for 2018. Kayla has been beautifully made with a necklace and heart accessory. This little koala wants to be loved and we think it wont be long before someone adds this adorable creature to their collection. 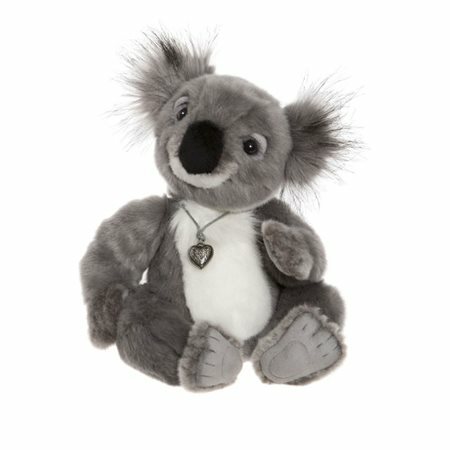 Kayla the koala bear by Charlie Bears has been created from soft plush grey fur and joins us as part of the Happily Ever After collection, new for 2018. Kayla has been beautifully made with a necklace and heart accessory. This little koala wants to be loved and we think it won't be long before someone adds this adorable creature to their collection.